Women In Business - What Works Best For You ...Sun or Shade? Name: Women In Business - What Works Best For You ...Sun or Shade? Women in Business - What works best for you... Sun or Shade? 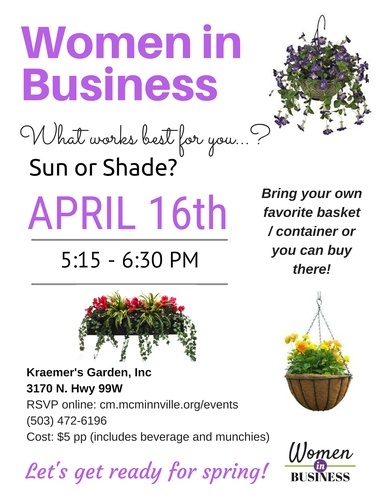 Join Chamber Women In Business for a fun and informative tutorial on creating a hanging basket - One that you get to take home with you. Sun or Shade is the question. • Can be purchased ready-made if you prefer – just hang ’em. You'll get to pick out and buy your own flowers and supplies - that will be followed by an instructed tutorial on best practices of assembly. ​BYO basket making supplies and contents or bring your own. Appetizers, and non-alcoholic beverages will be served.